Biography of Japanese Ukiyo-e Printmaker, Painter, Illustrator. The most famous figure in Japanese art during the Tokugawa Shogunate of the Edo period, Katsushika Hokusai was a master of fine art painting as well as Ukiyo-e woodblock prints, excelling at portraiture, landscapes, genre works and book illustration. Most of his greatest paintings and Ukiyo woodcuts were completed between 1820 and 1840. Considered to be one of Japan's best landscape artists, Hokusai's art spread to late 19th century Europe as a result of the Japonism craze, where it exerted a significant influence on French Painting, notably the schools of Impressionism (1870s/1880s) and Post-Impressionism (1880s/1890s). His prints were collected, in particular, by Whistler, Claude Monet, Edgar Degas, and Toulouse-Lautrec. Hokusai's best-known masterpieces include: the 15 volumes of drawings and paintings known as the Hokusai Manga (18141834); the three series of wood-block prints entitled - The Fifty-three Stations of the Tokaido Highway (c.1803-6, UCL Art Collection, London), Thirty-Six Views of Mount Fuji (18231829, British Museum and elsewhere), and One-Hundred Views of Mount Fuji (1834); and the individual woodblock prints known as - Mount Fuji in Clear Weather (c.1829, British Museum, London), and The Great Wave off the Coast of Kanagawa (1830-2, Metropolitan Museum of Art, New York). The latter picture is one of the world's best-known examples of poster art. Hokusai's main rival was his younger contemporary Hiroshige (1797-1858), the last of the great Ukiyo-e artists. Born into the family of the mirror-maker Nakajima Ise, in the Katsushika district of Edo (now Tokyo), in the 10th year of the Tokugawa period, he started to paint at the age of six, after learning the art from his father, whose work included the painting of decorative designs on the mirrors and their frames. From 1774-8, he was apprenticed to a master of wood-carving, after which he entered the workshop of Katsukawa Shunsho, a specialist in ukiyo printmaking - a new and popular type of brightly coloured woodblock printing - and leader of the so-called Katsukawa school. At this point, Ukiyo-e, as practiced by artists like Shunsho and the young Hokusai, concentrated on pictures of scenes from the Kabuki theatre, as well as courtesans, geisha and other popular figures of everyday city life. In about 1795, Hokusai left the Katsukawa school and began investigating other styles of painting, including Dutch Baroque works and compositions by French Baroque artists, which he had encountered in the form of copper engraving. At the same time, he changed the subject matter of his painting, switching from pictures of courtesans and Kibuki actors to landscape painting and genre painting. About 1795-5 He began associating with the Tawaraya School, and produced numerous brush paintings (surimono), as well as various types of illustration for books of poetry (kyoka ehon) and calendars. He also began producing a series of pictures of elegant, beautiful women (bijinga). In 1798, at the age of 38, Hokusai decided to start up as an independent painter and printmaker, free from any ties to a school, and, within a short while, adopted the name he is remembered by today, Katsushika Hokusai. Over the next 20 years, Hokusai established himself as one of Japan's most innovative artists, enriching his style of Ukiyo-e with eclectic elements from Chinese art as well as Western painting. He also made a thorough study of works by classical Japanese and Chinese painters. In 1800, he produced two notable collections of landscapes: Famous Sights of the Eastern Capital and Eight Views of Edo. He also proved to be adept at self-promotion, securing several audiences at the Shogun court where he demonstrated his skill at painting with considerable success. 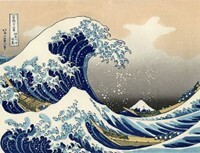 In 1811, he began work on the Hokusai Manga. This work eventually comprised 15 volumes of drawings, paintings and illustrations, characterized by fine energetic brushwork, depicting fantastic scenes from traditional stories and legends, as well as birds, animals, religious figures and scenes from ordinary urban life. He also published a variety of art manuals (etehon), such as Quick Lessons in Simplified Drawing (1812). Over the next two decades, Hokusai entered the period of his greatest fame. From 1820 to 1832, for instance, he created the landscapes and "bird and flower" prints which are now considered to be his greatest works. In 1823, for instance, he began working the series which secured his reputation as one of Japan's best artists of all time, the Thirty-Six Views of Mount Fuji (18231829, British Museum and elsewhere) - a series which proved so popular that he added an extra 10 prints. It represented the culmination of his mature style - a style which combined realistic detail with imaginary views - and included his two famous prints, The Great Wave off the Coast of Kanagawa (1830-2, Metropolitan Museum of Art, New York), and Mount Fuji in Clear Weather (c.1829, British Museum), both of which owed a great deal to classical Japanese painting. During the period 1827-1830 he started a number of other famous series, including his Tour of the Waterfalls of the Provinces, Unusual Views of Celebrated Bridges in the Provinces, and Bird-and-Flower series. His last major series was a set of black-and-white books entitled One-Hundred Views of Mount Fuji (1834-5), which showcased his exquisite drawing skill. His final work of note was a series of Ukiyo-e prints entitled One Hundred Poets (1836-40), begun when he was aged 76. 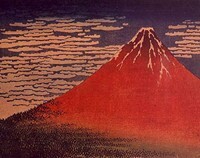 Although less than 30 were published, the designs for a further 64 were finished completed, including several which rivalled the quality of images in his earlier Thirty-Six Views of Mount Fuji. In 1839, at the age of nearly 80, Hokusai suffered a terrible loss when fire swept through his studio destroying all his paintings and drawings, but it seemed only to spur him to greater efforts. In fact, he continued producing works up until he died a decade later. Most of these late pictures were brush paintings - also known as ink-and-wash painting, or suibokuga or Sumi-e - and the quality was variable. Moreover, his popularity was beginning to wane as that of Ando Hiroshige began to increase. He finally passed away on May 10, 1849, and was interred at the Seikyo-ji in Tokyo. On his deathbed he reportedly said: "If only Heaven will give me just another five more years, I could become a real painter." In Hokusai's hands, Ukiyo-e was transformed from a relatively narrow form of portrait art - focusing on popular courtesans, geisha, sumo wrestlers and actors from the Edo Period in Japan's cities - into a much wider and more complex style of art that included landscapes, plants, and animals, as well as traditional portraits and genre scenes. Inspired himself by classical oriental art, from China as well as Japan, Hokusai in turn influenced modern artists in Europe. Famous painters who collected his woodblock prints during the Japonism phase of 1865-1910, included: Claude Monet, Auguste Renoir, Edgar Degas, Paul Gauguin, Gustave Klimt, Franz Marc, August Macke, Edouard Manet, Toulouse-Lautrec, Van Gogh, to name but a few. Other modern art movements like Art Nouveau in France and Belgium owed much to his Ukiyo-e prints, as did Jugendstil in Germany, although his greatest impact was on Japanese art. Paintings, woodblock prints, illustrated guidebooks, silkscreens, surinomo and other works by Katsushika Hokusai can be seen in many of the best art museums around the globe.  For biographies of other Japanese artists, see: Famous Painters.  For more details of painting and printmaking in Japan, see: Homepage.